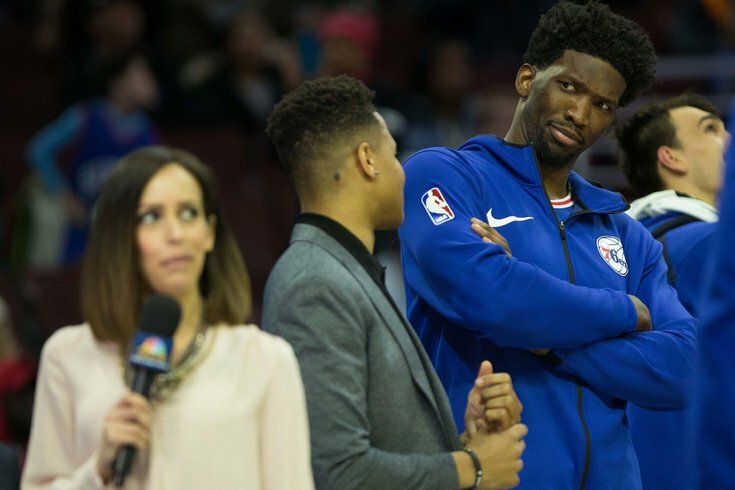 Philadelphia 76ers center Joel Embiid goofs around behind television analyst Molly Sullivan as she reports during closing minutes of a game against the Memphis Grizzlies at Wells Fargo Center. The Sixers are winners of at least 40 games for the first time since the 2010-11 season. Beating the life out of the Memphis Grizzlies is what happened on Wednesday night, but the big picture is what Sixers fans have to be thinking about with the end of the regular season finally in sight. On a cold, snowy night in South Philadelphia, the Sixers experienced a role reversal of what they'd gone through as a franchise. It used to be the home team with nothing to play for but pride down the stretch, undermanned and outgunned by teams fighting for playoff seeding. They are finally in a position to be the sort of team that takes advantage of those rebuilding, woebegone squads, and their 119-105 victory doesn't come close to conveying how comprehensive the win was over Memphis. By the time the third quarter came to a close, the Sixers' starters had finished their work for the night. No single player stood out in the top group — Ben Simmons scored the least with 13 points, and Dario Saric, Robert Covington, and Dario Saric tied for the lead with 15 points — nor did they really need to. The Sixers dispatched of the Grizzlies by sharing the basketball, a pillar of their philosophy that has not changed regardless of the turnovers caused by their passing. When you have two players who are top-tier passers at their position, this sort of rubs off on the rest of the team. It really all starts with Simmons and Saric, who can cut up teams with passing even when they're not earning assists. It sounds like a total cliche to point out that you can't teach height, but each and every night these two guys make passes that would be impossible for shorter players to see, let alone make. Simmons will sometimes dribble himself into a trap and look out of options, only to pull a play out of his behind that leads to an open shot. Simmons' height/length allows him to get out of some situations other guys simply aren't able to. I have very few beliefs about basketball that are set in stone — you learn new things all the time following this sport — but one is that good passing and unselfish play from one guy can inspire an entire team to raise their level in that department. A team's best players shape the identity of their squad. Look back at some of the league's best passing teams throughout history, like Tim Duncan's Spurs or Larry Bird's Celtics, and you will find passing geniuses from which they drew their strength. It's obvious something like that is taking hold in Philadelphia. When guys like Amir Johnson are dropping behind-the-back dimes in transition, you know you have something special brewing. Look, we're nowhere close to drawing connections between these Sixers and those great teams of the past. It'll be years of healthy and successful basketball before we can start having those talks. The giant, neon signs lighting the path forward are just too glaring to ignore from where we sit today. Unselfish basketball earned everyone a rare night of stress-free living at the office, and their coach was happy to sing their praises after the game. "The third period, our starters came out and I thought were fantastic," said Brett Brown. "Fantastic sharing the ball. To have 32 assists for the game and to set that stage with our ability to rest them because they built such a large lead is fantastic." There are times when you don't even see the opportunities for those assists coming, right up until Simmons threads the needle and finds one of his buddies in transition. The Sixers are happy to run the floor because they know there's a good chance they'll be rewarded for it. Perhaps the Sixers sensed a chance to earn some rest with a back-to-back looming in Orlando on Thursday night. They played with a sense of urgency when they took the floor in the second half, wanting to put this game beyond doubt so they could whoop and holler from the sideline while Richaun Holmes threw down dunks in garbage time. If that was the goal, they definitely made the most of their time on the bench. Sometimes, there's no big story at the center of the game itself. So let's discuss a few big picture storylines on the horizon following Philadelphia's beatdown of the Grizzlies. With Philadelphia's playoff spot all but locked up, one of the only things left to debate is the value of pushing for one of the East's top seeds. The Sixers don't necessarily need to go all out to claim the No. 4 spot — their remaining schedule features a lot of cupcakes — but they do need to grapple with how to handle their franchise center. During his media availability earlier in the week, Brett Brown expressed a desire to get Embiid some rest in the time before the playoffs start. He even highlighted this back-to-back against Memphis and Orlando as a potential chance to let Embiid rest. But if the decision is left to the man himself, Embiid is not going to sit the rest of the way. Pressed by reporters on how he feels about the possibility of sitting, Embiid wasn't having it. Well, I'm playing in every game. We didn't come this far to rest me. I was always complaining about playing every game, playing back-to-backs, I'm sure the fans were too. I know they were. Now that we're here, I can understand maybe the last game before we get ready for the playoffs, but other than that, I want to play every game. That's my first time I get the chance to do that, and if I play every game the rest of the season I think I'll be at 71. The goal going into the season was never close to that, not even close. I feel better about myself, I feel good about myself if I keep playing, because I've been healthy the whole season and I've been doing my job, and I know that when I play we have a better chance to win. You'd be crazy to dampen Embiid's competitive spirit, and this is absolutely the answer you want to hear from the guy who is leading your franchise moving forward. Accepting "good enough" is not in his wheelhouse, and he wants to make sure the Sixers are fighting for positioning until the season officially concludes. That being said, it's not really this simple. Embiid has played far more minutes than he's ever played in a single season, and he's gearing up for the most demanding, physical basketball he's ever been asked to play. Referees let things go in the playoffs they wouldn't in the regular season, and a post brute like Embiid is going to take a beating in the postseason. Would it be the worst thing in the world to get him a couple games off before going through that? Absolutely not. The problem is, the Sixers suddenly have a ton to play for. Thanks to losses for the Wizards and Pacers on Wednesday night, Philadelphia is in the driver's seat for home court advantage in the first round of the playoffs. The Sixers currently sit in the No. 4 spot in the Eastern Conference, and with games in hand on Washington and Indiana, neither team could catch them if they won out to close the year. If we were basing their odds solely on strength of schedule, the Sixers will be in the conversation for the third seed in the East. That would be a remarkable achievement for a team as young as the Sixers are, especially when you consider they've gotten nothing from the No. 1 overall pick they traded up for last June. It's just as significant in the big picture as it is in the here and now. The Sixers have not been a top-four seed in the East since all the way back in the 2002-03 season and they have only hosted two series since 1990, with both coming during Allen Iverson's peak in the early 2000's. This is uncharted territory for the franchise, let alone for the young players who have helped them reach this point. And while I ultimately believe talent wins out in a playoff series, the Sixers' record at home should give you an idea of how critical home court could be: they are 23-11 at home and 17-19 on the road. The former undersells how good they've been there for the last few months, with early season struggles downplaying their ceiling a bit. For the franchise player and the rest of the guys around him, rest is not on their mind. They want to do something that is pretty foreign for this franchise, and for all the concern trolling over culture the last few years, it sure looks like they have a strong one now.